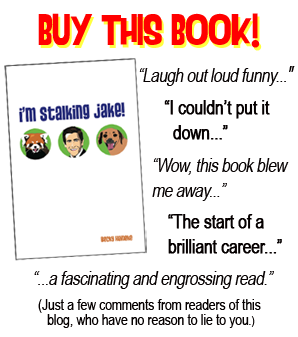 For the first time since its publication, I read I'm Stalking Jake! cover to cover this week. I am extremely proud of the end product. 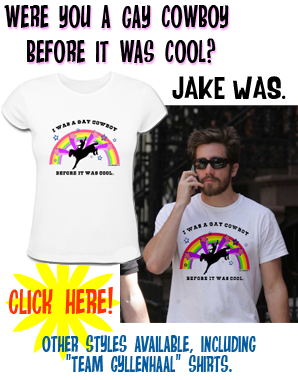 I'm proud of the work that I did with Jake Watch, and remain astonished at my luck in finding such a productive and complementary partner in Susie (britpopbaby). And yet I also now understand why so many people have commented to me on the "honesty" of the book as a whole. As I wrote it, I was concerned I may come off as too sanctimonious. I see now that those fears were ungrounded; I did a remarkable job of leaving my character flaws prominently in place. It made me laugh, it made me clench up in rage...it was surreal to acknowledge that the story that I was reading was the story of my own life. And not only that, but the story of my life as written by me. That being the case, I can't quite explain how it was that I stayed up past my bedtime three nights in a row because I was dying to know "what happened next." 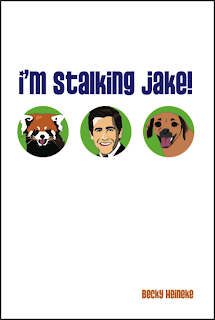 Jake Watch wasn't just a blog. It was an adventure. And it was a work of art - living and breathing art - that swept me and so many other people up in its wake. I comment at one point toward the end of the book that there was nothing like it on the internet. And there wasn't; there still isn't, and I doubt there ever will be. If you haven't yet read the book, I strongly encourage you to do so. An endorsement from the author may seem like a conflict of interest, but I wrote the damn thing and I hadn't read it yet, either. Not really. Not from the perspective of a reader, rather than a writer. I think everyone should read it too... now. Damn skippy! Job well done! Very well done, indeed! I am too, very glad you wrote it! You did a fantastic job, and I think everyone should read this masterpiece. I know, I already said it: I´m so grateful you wrote it. Thanks again, Becky! For letting us be a part of your life! You should be proud, Becky. The blogs are amazing, I've told you how damn funny I think they are. It's some of the best stuff I've ever read anywhere. I don't post often, but I hope you know that I am a huge fan. Thank you so much for all the kind comments. I keep not replying because I keep not knowing what to say. I'm just so happy that something I loved creating and writing about turned into something you all loved to read. :) Thank you!! 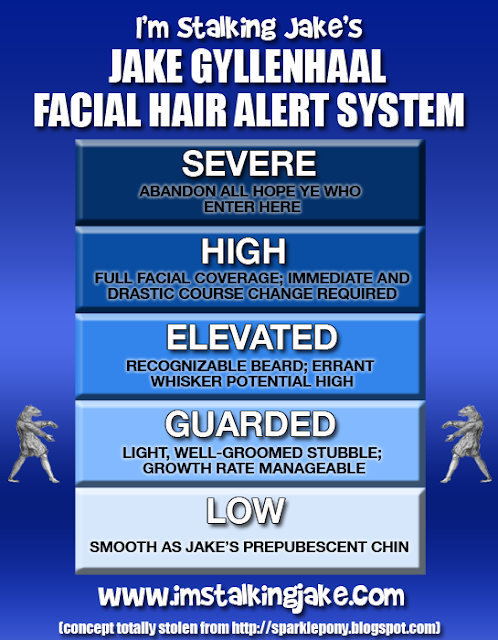 Check out this Jake Gyllanhaal look-alike! He's in a YouTube movie that kind of abit Fight Club and abit Inception. His HOT!!! question.... if I'm going to nyc and i really really want to meet jake.... where do you think the best place to find him at would be so that i can meet him? Love your sense of humour, too. Design of data your shared is pretty simple and a decent easy to understand interface. Experience is essential in each industry. We have great involvement in packing, shifting and moving the merchandise according to our client's craving and needs. We are one of driving and trusted online entrance giving you free citations from #top #packers and #movers organizations in #Hyderabad and other real urban communities and towns of India. There are several xtgem.com/ fake websites that are Website supplying download links to changed version of Game killer Game Killer Install Download For Android Free | Game Killer APK which contains virus. We request you to download and install Game Killer from our official website only and also share Game Killer App with your good friends. The cost of diesel in India is approx 50 to 55 INR and the cost of petrol is approx 75 to 80 INR. Now, you can calculate the cost of car transportation on the behalf of kilometers. You have to take all necessary documents with you before driving like RC and license. A few points to know. One of the atavist.com/ most noticeable different in between running Read This Article baby strollers as well as the basic variety is safety best convertible car seat reviews typically the front wheel it could be either taken. On TourtravelTourism.com you can book the Char Dham Yatra package. We are having an extensive range of char dham yatra package, holiday package, best deal on hotel bookings and car rental and luxury buses booking services. Please contact us for getting more information 07351064829.